I have never taken my children to watch Sunderland Airshow - despite it being probably the largest free attraction in our region, I have always been a little bit scared of braving the crowds with three very active children and remember huge queues for the park and ride when I was a child so when DFDS Seaways asked if we'd like to blog about our visit of course we jumped at the chance. I loved the idea of a hassle free way to watch the show without any stress. Saturday 25th July arrived and although it was cloudy it wasn't too chilly as we boarded KING Seaways and left the mouth of the Tyne. We headed straight up to the mermaid bar on level 10 which I think offers the best best views as you set sail. Harry, Heidi and Jack were entertained with balloon modelling and face painting (all included with our ticket) as I enjoyed a drink with my mum who was accompanying us on the trip. 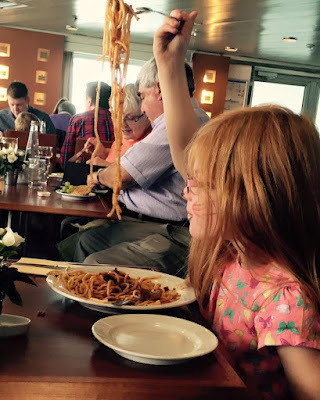 We stopped for lunch in the 7 Seas restaurant where we filled our plates with spaghetti bolagnese, chicken curry with rice and lasagne and salad before some delicious lemon cheesecake. The timing was perfect as they announced it was time for the show to start just as we were leaving the restaurant. We headed out to deck where there was plenty of space to gain a wonderful view of the spectacular stunts, amazing dips and dives and super fast action with plenty of gasps from the crowd as various aircraft flew right above our heads and in front of us. As the typhoon flew right above our heads the noise really was piercing but luckily we could quickly dive inside and watch through the window without missing anything. Two hours was certainly enough for me and my children did start to get a little bored towards the end so I was thankful we could head inside for some entertainment before sailing home. Some people have commented you miss half the show if you watch it from a DFDS day sailing and although I can see their point, 2 hours was more than adequate for us. If you would like to watch the whole of the airshow, a day sailing probably isn't for you. However if like us you would like to see some of the highlights from a fantastic viewpoint in a hassle and stress free manner, then a DFDS Seaways Airshow trip could definitely be for you and is something to consider for 2016. We headed into the lounge as our ship headed back to North Shields and were entertained by a pretty decent live band and disco as we enjoyed a drink in the bar. There was a real family party atmosphere with lots of people up dancing and singing along together. Before we knew it we were home and were sad to leave KING Seaways until next time. 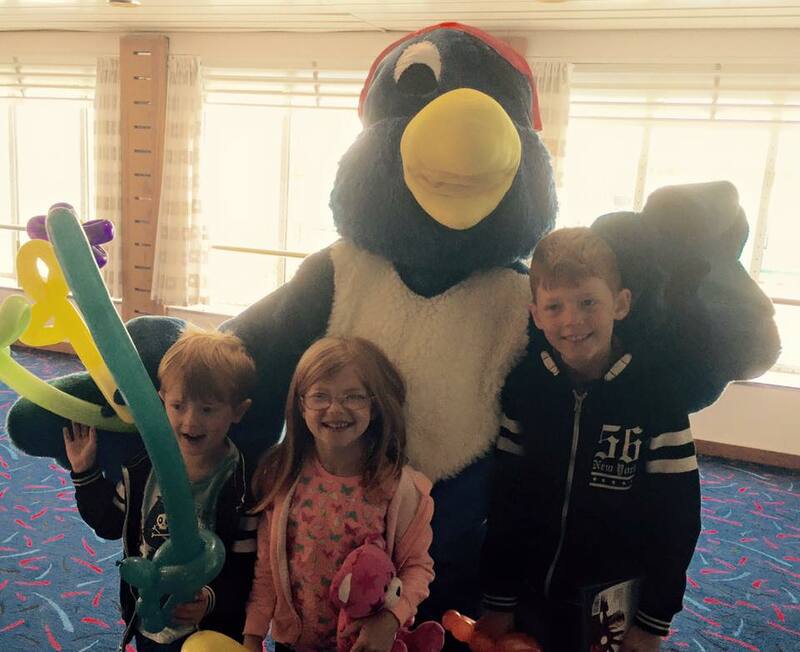 We couldn't leave without a quick cuddle from our favourite pirate parrot. We have made a 2 minute video of our trip below featuring our highlights - I'd love to hear what you think. Visit http://www.dfdsseaways.co.uk/ to keep up to date with other DFDS Seaways day sailings. A three course lunch is included with the price of your ticket however drinks in the restaurant are not and they are very pricey ( 4E for a can of coke, 6.5E for 1 litre of water). Drinks in the bars were not as expensive (£10 for five soft drinks). There is free entertainment on board before and after the show including face painting, balloon modelling, wildlife spotting and talks, live singers, discos......make the most of it! I really want to go to the Airshow but the thought of all the crowds does put me off. Seeing it from a boat seems like the perfect alternative to me, such a great idea! Dont bother you are not at the air show that long and every single bar but one is shut during the whole journey even the shop. This as we should have been in Tunisia. I'm sad we missed out because I too am not good in the size of crowd that the airshow attracts! You are there for a short amount of time and everything on the ship is shut for the whole journey. There is a soft play but it is very small. Drinks in the restaurant are very expensive. £4 for a pint of coke. Scandalous. If i were you i would take your own drinks as no one checks once you are on board. What a great way to see the air show - perfect for little ones. Shame we missed it - coming up to the north east soon to visit my family there. So many things to keep the children busy! Nice way to watch the air show! !